School buses carry precious cargo: our children. Therefore, drivers must always remain alert and drive carefully when around school buses. Like other states, Florida has special laws (Statute 316.172 ) http://www.leg.state.fl.us/statutes/index.cfm?App_mode=Display_Statute&URL=0300-0399/0316/Sections/0316.172.html that protect the students on board. This includes stopping the car until the bus stop sign closes. Two-Lanes: On a two-lane road, vehicles travelling on either side must stop if children are boarding or exiting a school bus. Multi-Lane: Like two-lane roads, vehicles travelling in both directions must stop and wait for the school bus sign to close. Divided Highway: On a divided highway with a physical barrier or unpaved space of at least 5 feet, raised median, the vehicles behind the school bus or heading in the same direction of the school bus must stop, whereas vehicles travelling in the opposite direction do not have to, but should proceed with caution. Stop to the Right: Stop as far to the right of the street as possible and display warning lights and stop sign. Obscured Visibility: A school bus driver shall not stop in a place where their visibility is obscured for 200 feet either way from the bus. Not abiding these rules could result in traffic infractions, criminal action, or worse a tragic accident that can cost the life of an innocent child. 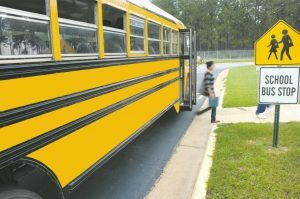 When you are driving behind a school bus, retain a greater distance from it than if you were driving behind a regular vehicle, as it is highly likely they are picking up or dropping off students. Doing so will offer you more time to stop when the yellow light flashes and the stop sign goes on. Young children are often unpredictable and can startle you by suddenly crossing the road. Keep in mind that children often take risks and ignore hazards because they are too young to understand the consequences of their actions. It is thus your responsibility to keep an eye out for their safety whenever possible. Also, don’t forget to teach your kids who are young drivers to be extra vigilant and let them know of the responsibilities and safety precautions they must take when operating a vehicle. As well as let your children who ride on school buses know of the hazards that can arise when loading and unloading from a bus. Follow these important driving tips to ensure the safety of our children, our future.